Introduction: Development of the Police Estate. The following sections of the Police Estate topic have been selected to cover specific periods of the development of the police in Victorian Manchester. Each section covers a short but distinct period. As already indicated the overarching period of 1838-1901 saw a dramatic change in the utilities and equipment available to the Victorian police officer. The early borough police officers, newly transformed from Watchmen, had only the basic equipment of truncheons, rattles (rick), handcuffs (snaps), lanterns, brawn and common sense to assist them. 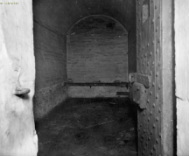 Their station houses were mainly basic lock-ups with little or no sanitation, suffering from poor ventilation lighting and heating. The WC minutes when annotated and arranged for each station reveal the slow modernisation of the buildings, until their eventual replacement (if achieved prior to 1901). By the end of the century the spread of gas lighting, clean piped water and heating substantially improved police buildings and officer accommodations. The installation of the telegraph and the telephone were later important changes. The introduction of operational mechanised transport during the twentieth century coupled with the new communication methods would permit in time a change to the tactical and operational needs of the police. By the 1890s the longer serving police officer would have seen many changes in technology. Their personal equipment to meet the four essential policing constants of light, communication, protection and restraint, did change but retained the same basic ability as at the start of the Victorian period - an improved bulls eye lantern by 1860 for light, by 1870 recognisable head gear rather than the top hat for protection, coupled with a more recognisable and serviceable uniform and by the late 1870's a whistle instead of the rattle for communication. For restraint the ‘snaps’ design of handcuffs remained until the 1970s. However, the police officers’ greatest asset remained their common sense and experience, and this increased in the last quarter of the century with the increased professionalisation of the force. The attached film clip [button below] from the British Pathé News site shows detectives throwing a prisoner into the above cells. 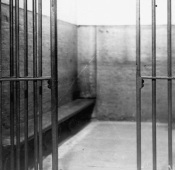 Afterwards he is taken from the cells in a horse drawn cart with police protection to Strangeways Gaol. The clip recorded @ 1910 is significant as it shows the basic cell corridor with gas mantles and the extent of the security protecting the station. It is considered that the film was made utilising a local inner Manchester station. Recent research has excluded the Town Hall even though the Detective Branch was based at the there along with good cells. This leaves Albert Street, Goulden Street Police Stations or possibly Minshull Street Police Court as this would be logical for sentenced prisoners going direct to gaol. However Court cell pictures [see Matrons] do not match the above view. However if you know otherwise please let me know.